Save the Date: Girls Night Out! This event is very near and dear to my heart ... 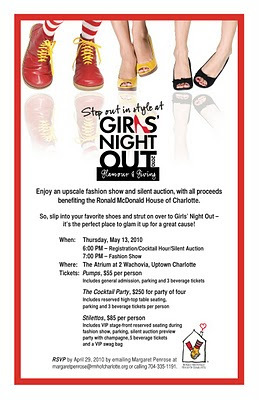 I'm producing the fashion show portion of the event and working with two other chairs (Melissa K. and Michele) to ensure that the first Girls Night Out Event in Charlotte to benefit the new Ronald McDonald House is a success, tons of fun and an all around fabulous event. Your official notice to save this date and if you don't live in Charlotte - well, plan to get here. I mean it. You can even stay at my place. Ha. Become our fan on facebook here.